ARAI has just launched its new Quantum helmet, entering the market just below the top of the range RX-7 GP. 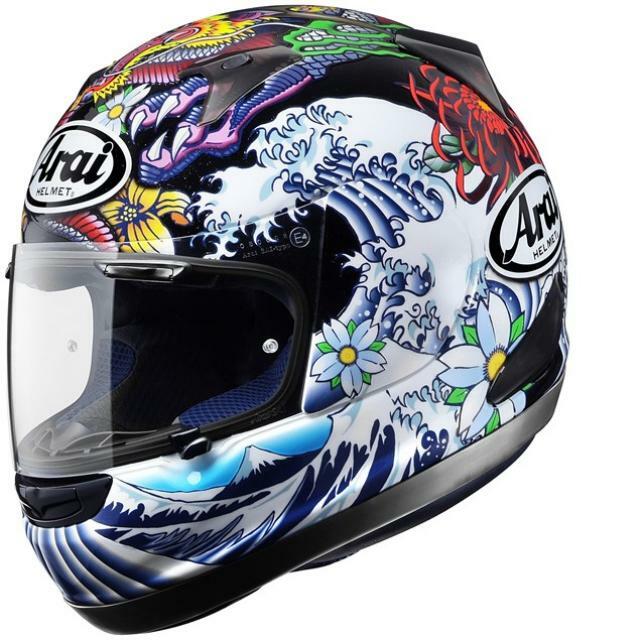 The Quantum is a re-invention of the best selling helmet that was produced from 1992 to 2001, a lid that many reckoned was the best fitting Arai in the range. The new Quantum steals safety technology from the GP and uses the same triple layer shell construction with a ‘Hyper Ridge’, which is basically a wider base, for added safety and ease of getting the helmet on and off. The vents have been updated and improved and the visor is 5mm wider on each side for better peripheral vision. It is the same visor as the GP so 'normal' Arai dark visors won’t fit. Sorry. The lining is fully removable lining is made of a Dry-Cool material for improved wicking to stop you getting a sweaty bonce. It also comes in a variety of sizes and foam densities for a tailored fit. Like the GP the Quantum also features Arai’s emergency release cheek pads. The Quantum will be on sale in mid-December and will cost £399.99 for plain colours and £469.99 for graphics.